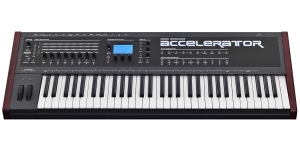 Accelerator, a virtual analog synthesizer by Radikal Technologies, was at the stage of development about as long as its predecessor Spectralis used to be, but at the time of release, it was a completed project and a fully implemented idea. Despite the many programming features, its structure looks quite logical: 3 oscillators, a noise generator and a ring modulator output using 2 and 3 oscillators, per voice. Similar to pulse-width modulation, there is the possibility of time linearity modulation for each oscillator, which can be applied not only to the pulse wave, but to all the others, after working on their phases and observing the shape change on the LCD screen. Complex harmonics can be achieved by synchronizing 1 and 2 oscillators or using the 2nd and 3rd one to phase-modulate all the three. 3 of the 4 LFOs are used to modulate voice parameters, while the 4th is global. This allows you to create patches with the assignment of modulation changes for a specific time for each note in the chord. In general, Accelerator offers 50 modulators and 32 possible assignments. 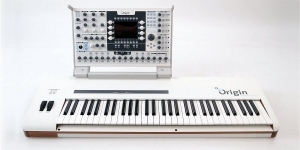 A unique modulator is the position sensor, which takes into account the degree (extent) of mobility of the instrument while someone plays it, thanks to the assigned axes. There are 2 basic multi-mode filters per voice and an independent filter dedicated to the noise source. String Filter gives an interesting result in string emulation, especially along with the dedicated pitch envelope and the addition of a small amount of noise. Sounds allow layering and keyboard split during exploitation. The series of sounds allow up to 10 patches in one chain, in total you can store 100 chains. 300 factory presets will reveal the full synthesizer programming capabilities palette. 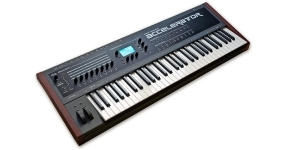 While LFO includes the "random settings" function, Accelerator also features a randomize function that automatically compiles a new sound by combining the parameters of existing presets. 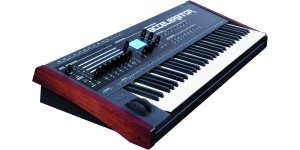 Given the 2-part multitimbrality of the synthesizer, the drum section can’t be called its power, however among the standard categories of bass, organ, lead, pads, etc. you can find such curious things as brassy pad, 2 filters bass patch or comb flute 2, evolving the spectrum of the sound of the string filter. Accelerator has 4 bus stereo effects and gives one effect per sound, which allows you to seamlessly alternate patches without any audible thresholds between algorithms. 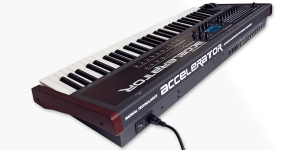 Accelerator rightfully takes place in the list of most powerful performing synthesizers. 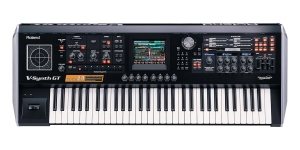 Built on digital elements, it is capable of producing both high-quality digital sounds and reliable analog ones. 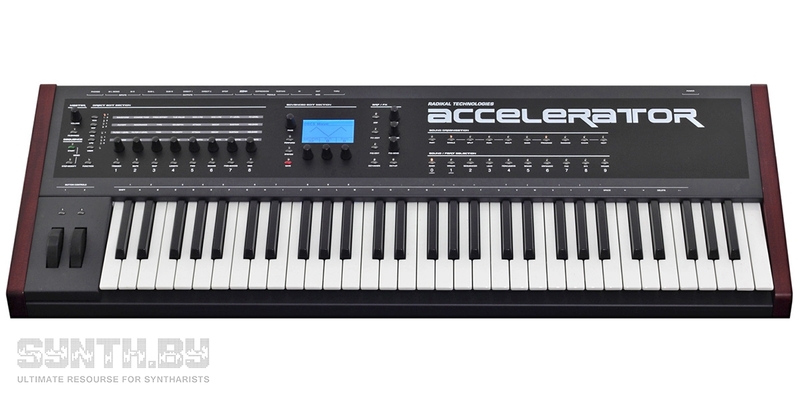 The smoothness of the flow is due to the continuously variable LFO waveforms and oscillator. It combines deep programming capabilities and versatile modulation with instant response of components and pleasant and easy use which is extremely important for live performance. 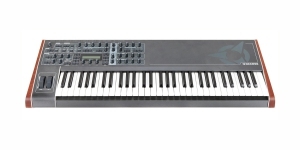 Synthesizer, Virtual Analog (VA), Voices: 32, Velocity Sensitivity, Aftertouch, Size: 5, Number of Keys: 61, Production start: 2008.